Bonn, Germany ï¿½ the fourth Corporate Startup Summit is going to be on 27th & 28th April 2016. For those who can already decide, apply the early bird discount until 19th of February and save up to 300ï¿½ on your tickets. With its most recent Corporate Incubation & Acceleration Summit in Berlin in December 2015, Corpo-rate Startup Summit hosted another fascinating event. Over a two days’ program international intra-preneurs and corporate incubators exchanged over their experiences and build new business relation-ships. Around 150 people attended the event to discuss corporate incubation and acceleration to an-swer questions like “what are the systematic challenges within organizations?” and “How do we deal or work around these problems?” during several workshop sessions and panel discussions. So it was not surprising, that because of the top notch speakers a great number of attendees already announced to visit another event in 2016. The preparations started early for Corporate Startup Summit 2016, since this will be the first interna-tional edition of the event series: Picking up latest trends and novelties from the corporate entrepreneurship and innovation world will make it an exclusive networking platform for its visitors again. Companies who don’t want to miss Corporate Startup Summit International 2016 book their tickets at www.corporatestartupsummit.com. The early bird discount is available until 19th of February. The next Corporate Startup Summit is hosted at Swiss Life Binz Center in Zurich, Switzerland on April 27th & 28th 2016. More information is available on www.corporatestartupsummit.com. 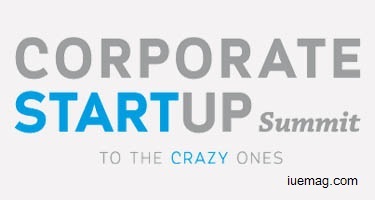 To find Corporate Startup Summit on Facebook go to www.facebook.com/Corporate-Startup-Summit-268046696672560. For more information write to info@corporatestartupsummit.com. Any facts, figures or references stated here are made by the author & don't reflect the endorsement of iU at all times unless otherwise drafted by official staff at iU. This article was first published here on 29th February 2016.